Welcome to the Official Site of C.K.I. Italy! The Creativ-Kreis-International/World Wide Artists is a non-profit artistic-cultural club, headquartered in Deidesheim - Germany. 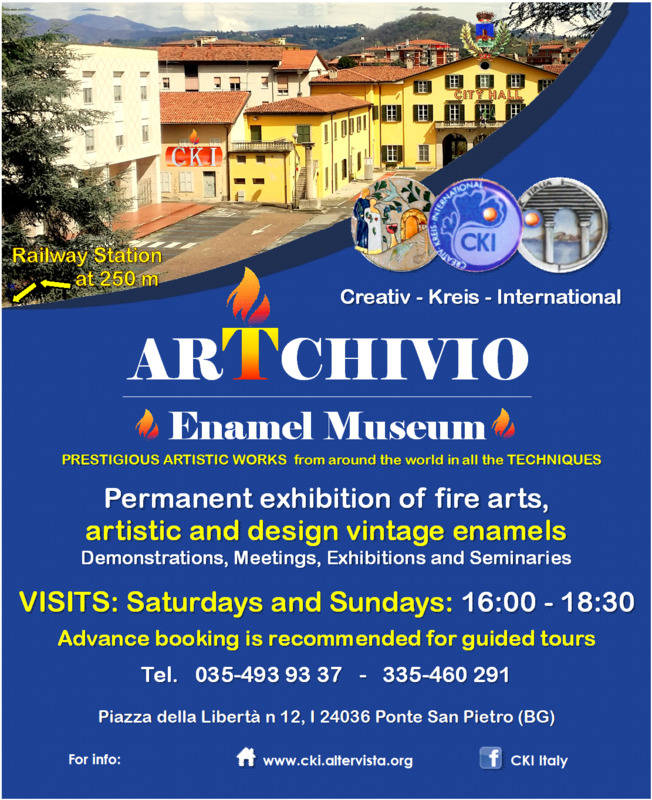 Since 1966. its initiatives are aimed at promoting vitreous enamel as an artistic means and favouring cultural exchanges between enameling artists from around the world. 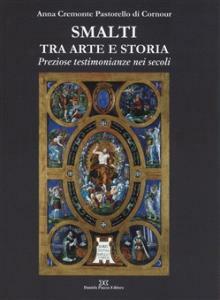 The book on enamel history “Smalti tra arte e storia” by Anna Cremonte Pastorello di Cornour, published by Daniela Piazza Editore in November 2018, contains texts and pictures acquired illegitimately from this website. If you want to enjoy the same information for free, read our Brief history of enamel, expanded over the years quoting the sources and constantly updated! The book also “borrowed” the pictures of a few works exhibited in our new Museum of Enamel “ArTchivio” in Ponte San Pietro, also without our authorization. Now you can follow us on our Facebook page and our YouTube channel! - We want to bring to your attention a praiseworthy initiative of the SPEF (Syndicat Professional des Emailleuers Français): the intention to ask for the inclusion of ENAMEL into UNESCO Intangible Cultural Heritage List, with the purpose to defend those who practice this ancient and difficult art from the (mainly European) legislations, that obstacle artists, craftsmen and factories dedicated to enamelling. We pray you to read the communique and to spread the word! Over a period of 35 centuries, many enameling techniques have developed, passing through many populations and civilizations distinguished by culture, religion and social background. An unknown design of destiny has preserved them and handed them down to us almost unchanged. They have been absorbed into (and spread by) many schools and artistic movements. The special fascination for this applied art has overcome every kind of obstacle, reaching our era almost untouched, thanks to an élite of artists who fell in love with enameling. It’s them who produced – and still produce – the amazing results of enamelling which become visible only after many firings in a kiln at 800°C. To all these artists, and especially to the members of C.K.I., are dedicated the heartfelt thanks from our founder Gertrud Rittmann-Fischer, the many international presidents of C.K.I. and, of course, myself.